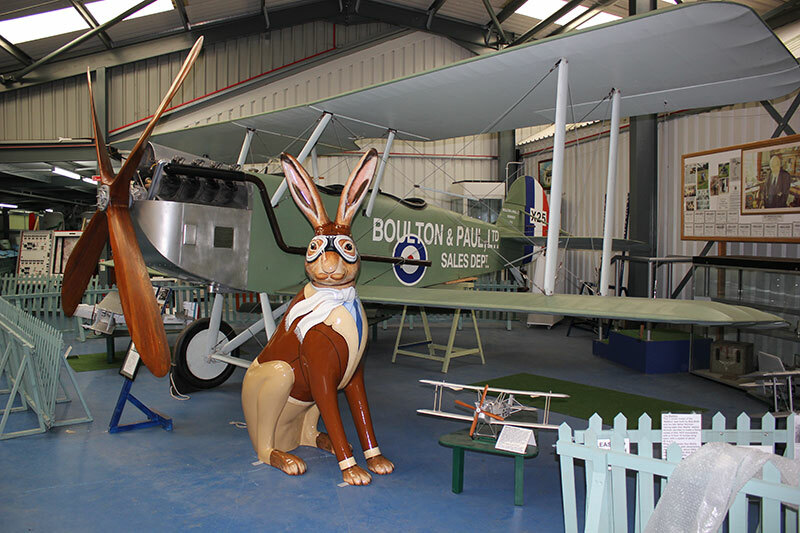 In celebration of the 100th Anniversary of the Royal Air Force and to say a great big shout out to a somewhat unknown history of industrial engineering in Norfolk, we chose to sponsor a GoGoHare with great character and spirit. 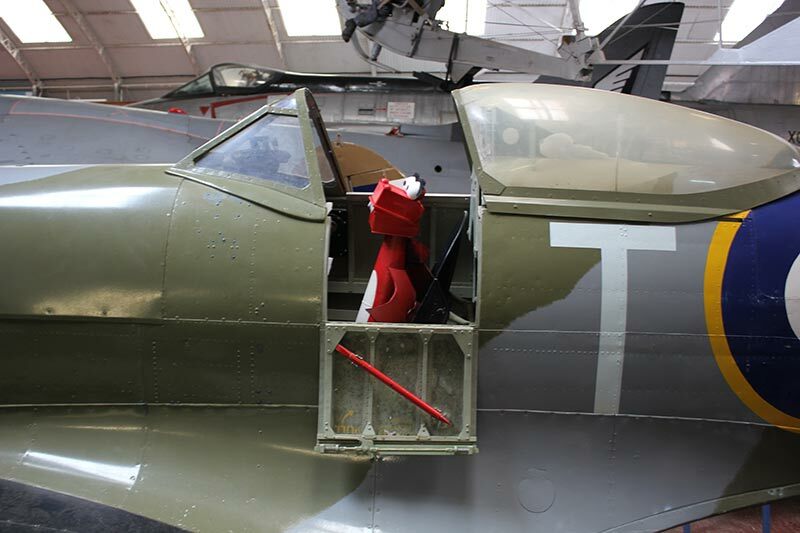 Artist Evelyn Sinclair created a gentleman with a stiff upper lip, and rather impressive moustache, complete with bomber jacket and goggles, we thought he’d fit in perfectly at Norfolk & Suffolk Aviation Museum. So prior to joining 49 other hoppy hares on the Break charity wild in art GoGoHares trail we took him on a road trip. With his old fashioned sense of adventure, Jack was ready to take to the skies and spread his sense of fun across the region. 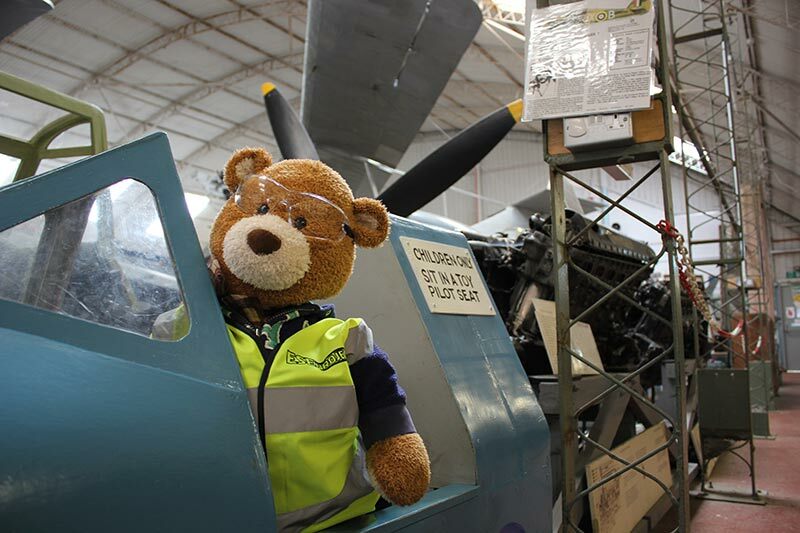 He didn't travel alone, he was accompanied by our resident dragon, George, and to ensure it was always 'safety first' our diligent furry warehouse worker and friend, Health and Safety Bear came along too. 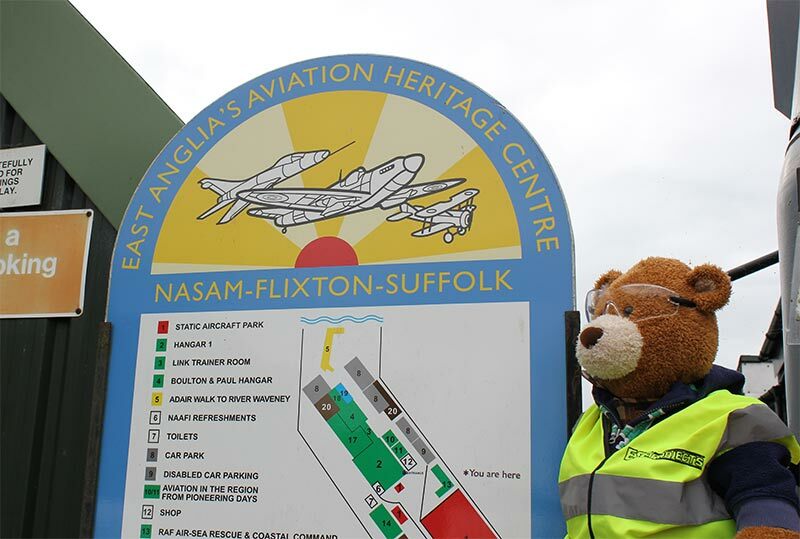 Norfolk is steeped in rich aviation history as several street names in Norfolk suggest; Aerodrome Rd - Heartsease, Hurricane Way - Catton, Spitfire Road - Catton, Douglas Bader Close - North Walsham, Boulton Street (off Rose Lane, where the Boulton & Paul factory was situated) and Vulcan Way. 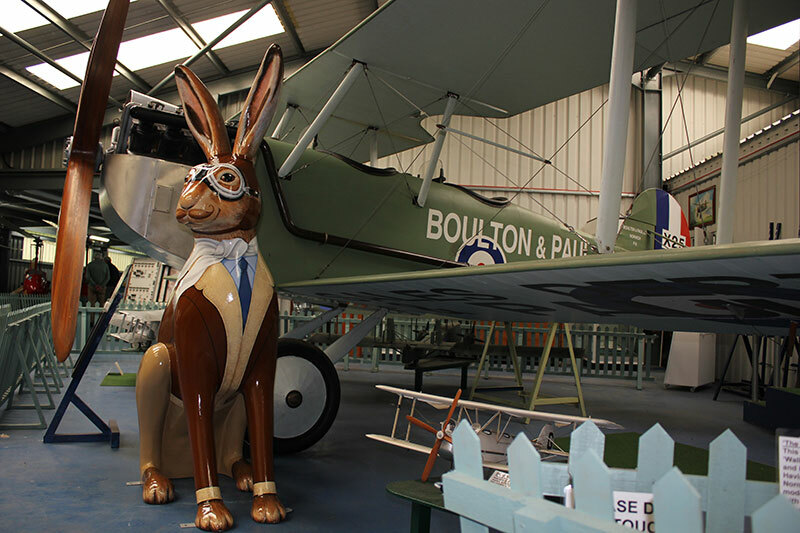 Norwich-based Boulton & Paul began building aircraft for the military in 1915, during the First World War, with a testing and training area formed on Norwich's Mousehold Heath. Unfortunately many of the factories were targeted during the war and sadly cease to exist today. The Norfolk and Suffolk Aviation Museum, in Flixton, near Bungay in Suffolk, is run purely by volunteers and funded by donations, we were given a very warm welcome by Huby and Paul, two ex-servicemen who were only too happy to show us around and help Hareman Jack get his ears through the narrow doorways of the aircraft hangars! 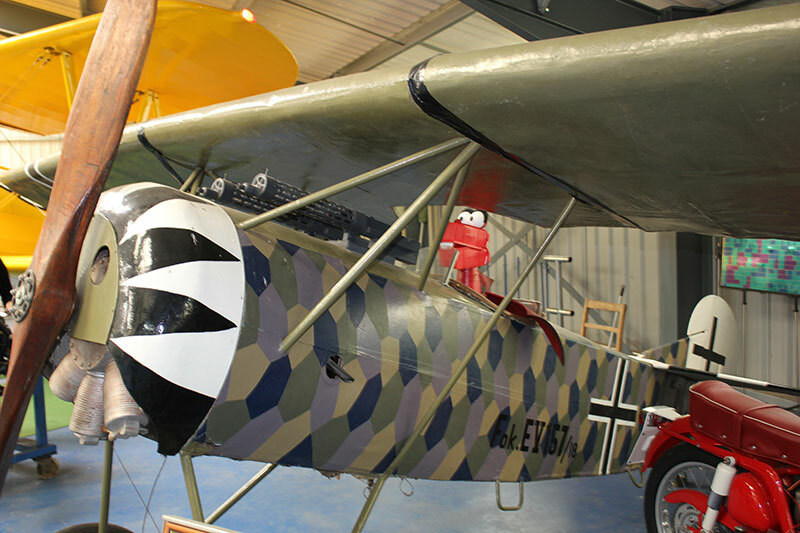 Hareman Jack Hargreaves was proud to stand next to this amazing locally made replica Boulton & Paul P9 aircraft. We think he looks right at home in his bomber jacket, silk scarf and flying goggles. Chocks away ole chap! 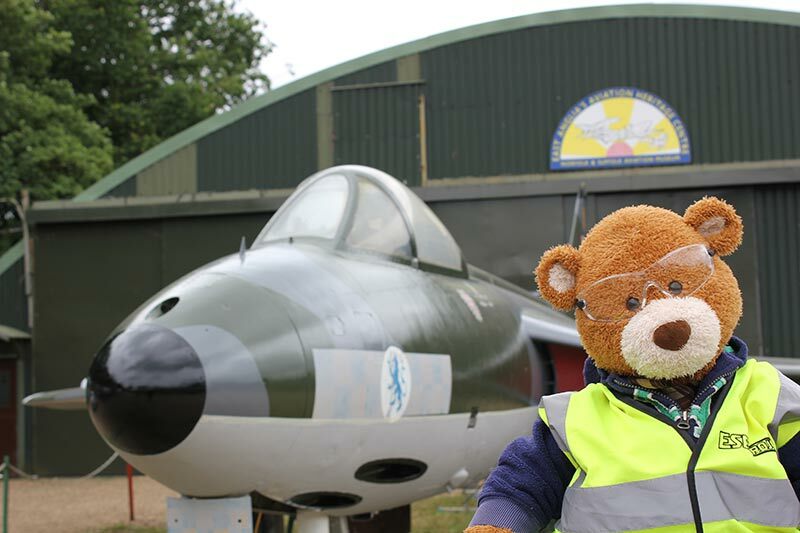 George took on the role of co-pilot but wondered if Health and Safety Bear had actually passed his driving test? It's George's turn in the hot seat, being a dragon, one might think he is used to soaring through the air, alas; he hasn't quite yet mastered the art of flying unaided. He looks great up there though, hold on to your monobrow George! 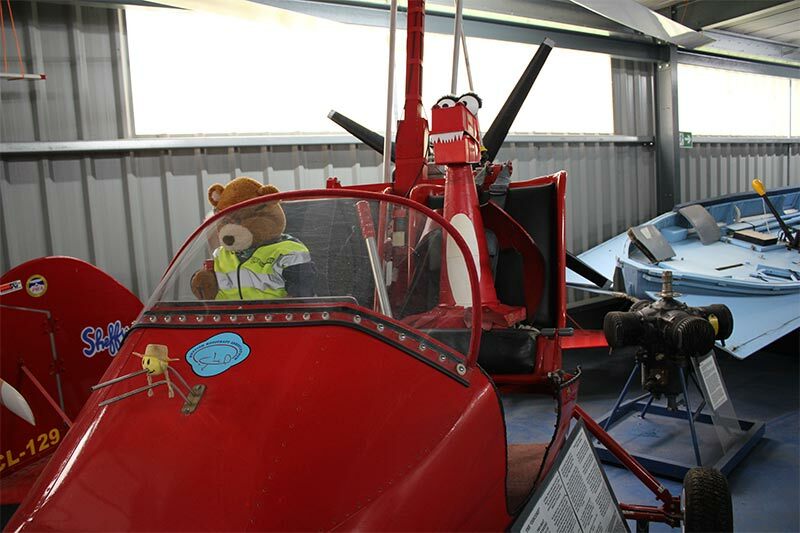 Health and Safety Bear tries out the children's pilot seat - it's a perfect fit! 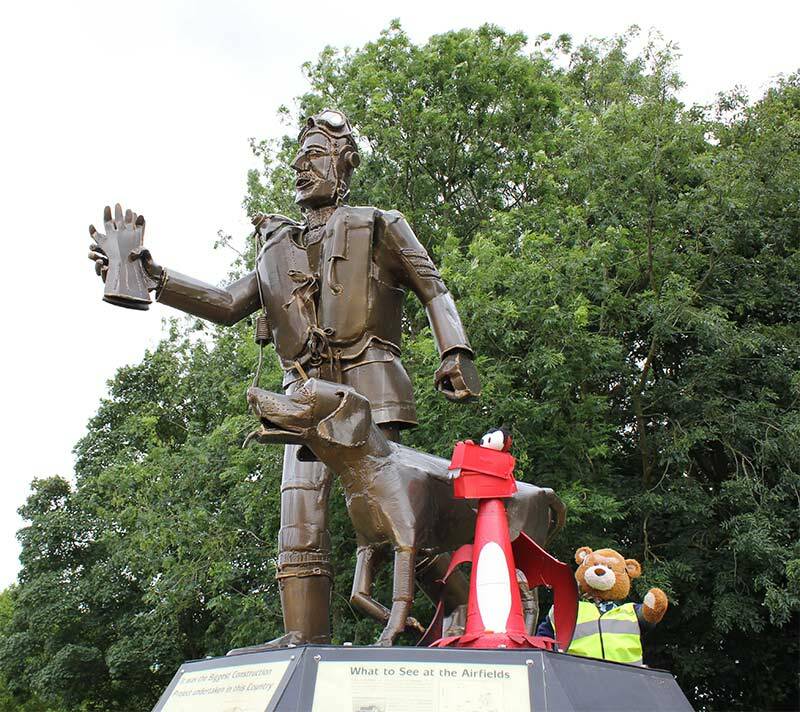 Health and Safety Bear helps point visitors in the right direction, there's such a wealth of memorabilia at the museum it's easy to get lost! Preparing for lift off, Health and Safety Bear takes on the role of air traffic controller. He certainly looks the part wearing his hi-vis waistcoat! Sculpture of a Second World War American pilot with his dog created by Suffolk-based steel sculptor, Paul Richardson. 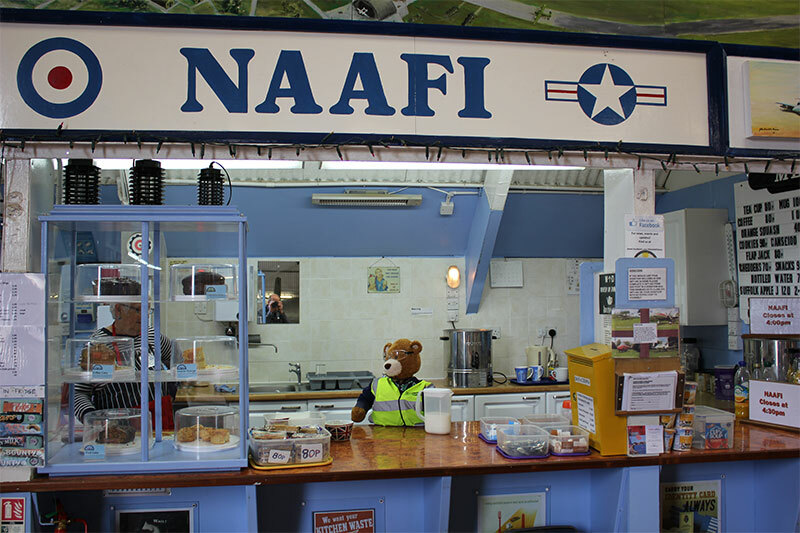 Health and Safety Bear made himself useful in the Naafi café, serving tea and cake, much to the amusement of some of the museum visitors! Guess it's not every day a furry bear asks if you'd like one lump or two?